50/50 are busy recruiting on FB and real life as you read this. They describe the process. You "register" for $29 (about P325) and then you'll "be allocated two people” who each “make donations of $125 (P1,400) each making (P2,800) to the two people allocated”. You then need to recruit 6 people beneath you and the pyramid starts to build. “2. Upgrade to Level $500 will earn you $1,500 (P16,800) in one week”. Etc etc etc until you reach Level 5 when they say you'll get $23,250 (P260,000). Let's do some arithmetic If 6 new people are recruited at each level and they then each recruit another 6, by Level 5 there will be 9,330 people in the pyramid. They will have paid a total of P3,032,250 to join. And you get a miserable P260,000. Someone somewhere is making a lot of money BUT leet's face it, they're not really. There aren't enough gullible people to make that work This is all about the small payments victims make to join this obvious pyramid scheme. The clues? Magic words (crowdfunding), multiple levels, exponential growth, impossible targets and the phrase “No selling of products”. The company does indeed exist but was registered in South Africa on 4th Jan 2019. Their domain was registered on 27th Dec 2018. This scheme is less than a month old. "build a solid financial base devoid of slavery, over bearing points and balancing that creates a stumbling block for active networkers to count their blessings." That appears to mean nothing. Their scheme consists of several levels as follows: Builder, Sapphire, Ruby, Emerald, Diamond, Crown diamond, Ambassador and Crown Ambassador. Hang on. Doesn't that sound familiar? This is an exact copy of the Jamalife pyramid scheme that was busy stealing people's money last year. Either this is the same people or it's a case of one pyramid scheme stealing from another. "Become a shareholder, Non Cash Incentives A family home worth 2 million, An Investment Property worth R1million, Furniture worth R500 000, Infinity Bonus of all your direct downlines R200 000.00, R200 000.00 Infinity allowance from all direct downlines becoming Crown ambassadors"
The clues? Multiple levels, crazy numbers, a copy of previous pyramid scheme, the fact that they admit it's all about recruitment and the big one, that in order to reach “Crown Ambassador” level, you'd need to recruit 16,777,214 people. Example 3. CBN aka "Charity Begins Nathi"
CBN offers the expected model of multiple levels of recruitment. At Stage 1 you get R60, at Stage 2 R120, Stage 3 bring you R1,100 and a R900 smartphone etc etc etc until you get to Stage 8 when you get R1.2 million plus a car worth R1.2 million, a house worth R2.5 million and furniture worth R500,000. Again, the arithmetic doesn't work well. To get to the top you'd need to have 2,015,538 in the pyramid beneath you. Did you see that? Even joining a pyramid scheme is forbidden. And if you're caught? You can face a fine of up to P100,000 or jail for up to 5 years. Or both. And another thing. Academic fraud. I contacted them and asked if they could write a Masters-level dissertation for me. Yes, they said, for just $900. 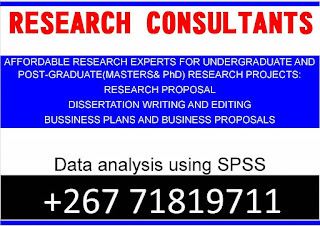 Referring to their customers in Botswana they claim to have helped "4 Undergraduate and 3 Masters students last year". When pushed further they told me they were "2 from Botho University and the rest UB." "Even now we have some projects for environmental science(Ph.D. ), 2 projects for education management( masters). Others are undergraduates"
All it would take was P4,000. And the subjects available? "Education management, marketing, accounting, psychology, environment management"
"It will be in your name. 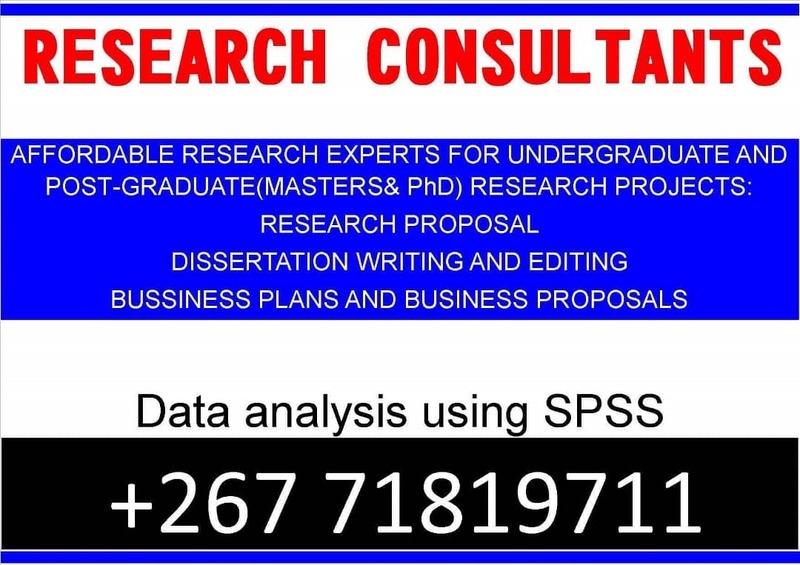 It will be yours"
"All professors work with research assistants"
"As long as you read and conceptualize it. Even Obama's speeches are written by other people"